The most important thing you can do is to make yourself seen. On the road, this is especially critical. Wear a reflective vest, headlamp, flashing strobe or a combination of the three. Also, have a friend run with an additional handheld light when running on the trails after dark to be able to watch for extra roots and stumps. Even with all the right clothing and gear, never assume that you are visible to everyone around you—always be aware of your surroundings. Whether your running brings you to the road or the trail, plan your route before leaving the house. Find a friend, spouse or other person that you can send a text to about where you are running and when you think you will be finished. Then, text them when you get home. If you are in a city, consider well-lit streets and be sure to check before all road crossings. Whether you could potentially face a critter in the woods or someone threatening on the street, consider taking some form of protection with you while nighttime running. If you often run alone, consider a self-defense course and/or mace. Or, if you find yourself deep in the woods, consider bear spray and/or a knife. Anytime you are running, you should be aware of what’s happening around you. At nighttime, this is even more important. Do you like running with headphones? Consider only wearing one side of the headphones. This way, you can hear if someone or something is coming up behind you. Also, watch for those cracks in the road and uneven pavement, as darkness often masks those little bumps. When heading out for a nighttime run, be sure to bring along your ID, a cell phone and an extra layer, if you are headed out for a long run. Weather changes quickly at night, and you want to be prepared for the worst. A light windbreaker can be crammed into a hydration vest incase of an emergency. Also, consider investing in a ROAD ID or other identification tags–this can include information about you, your insurance, emergency contact, blood type or any allergies. 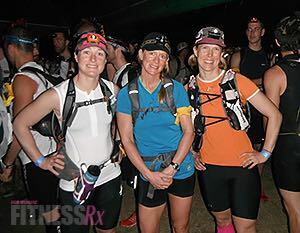 If you plan to run a lot after dark, consider finding a buddy to come along. Not only can it be more fun, but also you can look out for one another, especially if you are venturing into the woods at night. You never know when you will want a helping hand. While running at night, consider wearing flashy colors. Wearing all black and looking like a ninja is cool, but it doesn’t help make you be seen. Finally, consider your post-run nutrition before you leave home. My friend always has a Crockpot going with dinner while she runs. This way, dinner is hot and waiting for her when she gets home. 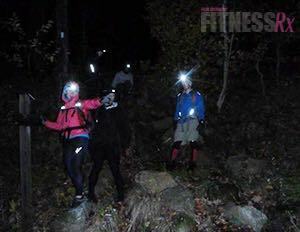 Overall, running at night can be a lot of fun and is not something to be scared of or intimidated by. Instead, think of it as an adventure. Find a friend and rediscover your favorite trail or route at another time of day. 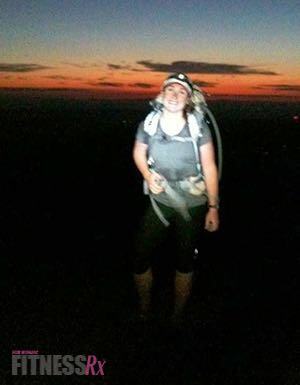 Some of my best adventures have come after dark or before sunrise. Also, there is something magical about hiking to the top of a mountain and catching sunrise or sunset. That’s the dirt for this week. Next week, we bring you more to take your training to the next level. Margaret Schlachter, the first professional female obstacle course racer, is a top ranked athlete in the Reebok Spartan Race series. She is also an endurance athlete specializing in ultra trail running races, a Spartan SGX Coach, and a CrossFit Level 1 Trainer. She founded DirtinYourSkirt.com, a leading source for all things obstacle course racing and endurance sports. For more information on Margaret, her upcoming book and online coaching services. Margaret's book "Obstacle Race Training: How to Beat any Course, Compete Like a Champion and Change Your Life" is available for PRE-SALE! Click HERE to reserve your copy.